I often get questions such as “Is Excel function XYZ available in Power Query as well?”. Well, you are now about to find out. Let’s focus on functions which we frequently use in the PPC industry. Click the link below to open the comparison spreadsheet and have a read yourself. Notice that almost all functions have a dedicated button in Power Query unlike in Excel so it is even easier & faster to work in Power Query than in Excel! This is just a short sample, Power Query offers hundreds of functions! 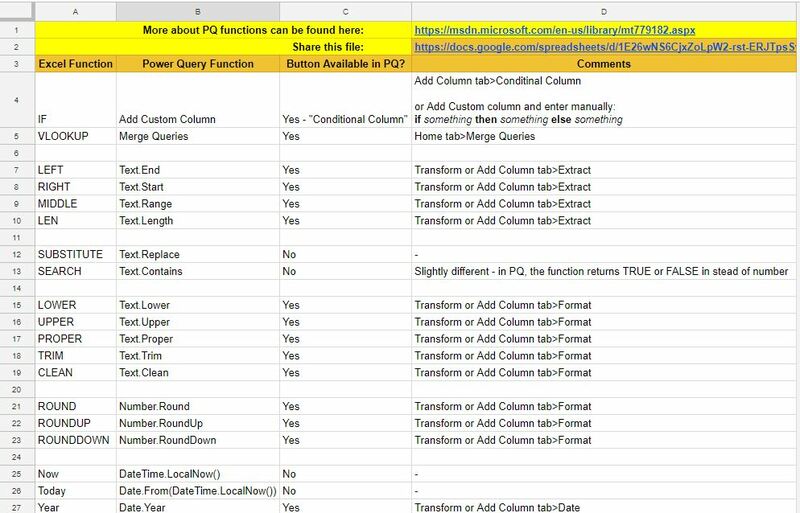 You can be pretty sure that your favorite Excel functions exist in Power Query as well. You can see that functions in Power Query are called similarly as in Excel. There is always a “function type prefix” separated by dot and then the name. You would probably guess the rest of the list if I just showed you few top rows. I will try to keep the file updated.